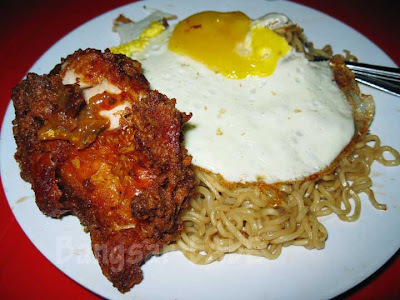 My recommendation for best Indomee Goreng is the version served up at Bestari (Desa Sri Hartamas, various). Order it with ‘burger daging’ which is a Ramly beef burger patty half cooked, minced up, and re-fried with the Indomee. Plus of course a ‘telur mata kerbau’. Note : Can be a ‘burger ayam’ if one does not take beef, but doesn’t taste quite the same. I think they need to take some egg frying course from me…. 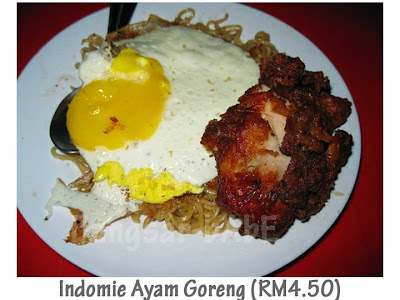 DF – I’ve tried the indomie goreng biasa at Bestari, but have never heard about the ‘burger daging’ version! lol, it sure do is the normal indo mee that we can cook at home, just that you need to tell them fried more dry, then it will taste nice. If not usually the whole indo mee is kinda wet and sticky. tts so cute, that comment – The indomie tasted like indomie !! i totally agree.. what’s the point if even me, ciki, can cook it ! haha;) is that chicken seasoning sweetish or savoury? should at least fry the egg nicely…really not professional la! we can fry better than them huh!? The chicken was savoury & infused with spices. Crispy and shiok! why are they so hard selling indomie ? This place is very unhygienic. You will be shock on the way they handle the food. Its SHOCKING!!!!! !